Sitting like a crown above an 18-hole championship golf course, Shaw Hill’s magnificent Georgian exterior is matched by lavish furnishings inside the building. With its own 18-hole golf course, the hotel is ideal for the golf enthusiast and our golfing weekends are popular throughout the year. Visit us on a golf weekend and you’re guaranteed one complimentary round per day (weather permitting), with others at a modest cost. The Varoons a la carte restaurant, which overlooks the course, is well respected far and wide for its award wining cuisine, extensive wine cellar and delightful atmosphere. Themed nights once a month include, Jazz Night and Piano Night. 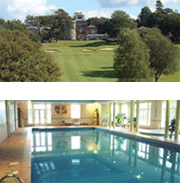 Last but not least pamper yourselves in our famous leisure complex with a 18m swimming pool, steam room, sauna, sun bed, hi tech gym, aerobics centre, spa, hairdressers and beauty salon – everything you could want for a relaxing stay in our country house hotel.